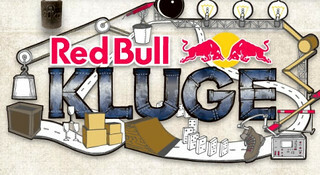 Red Bull Kluge: Absolute INSANITY. Every now and then I come across an absolutely insane video that I must share with you- the 2012 Red Bull Kluge is one of those. This video blew my mind. We’ve all seen these funny contraptions before… But not on this level. Trust Redbull, the marketing kings of universe to create something this extraordinary and over the top. Those guys are insane, and I love them for it.